Hard-fought battles, exciting races, changeable weather conditions: Maximilian’s DTM debut had the lot. In his first two races behind the wheel of a Mercedes AMG DTM C 63 at Hockenheim, Max experienced everything that the touring car series has to throw at a driver. 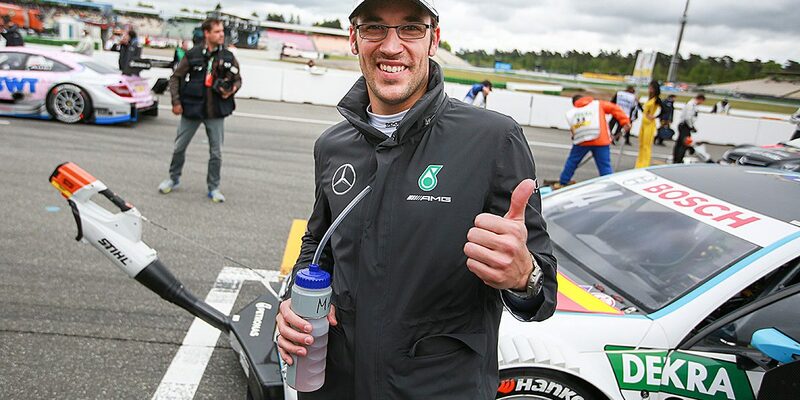 Maximilian, which aspect of the DTM surprised you most on your first race weekend? Maximilian Götz: Most definitely the way the drivers go about their business. It’s highly competitive out there, and every centimetre on the track is keenly contested. No-one ever holds back. Over the long distance, it was always quite different. In races lasting several hours, it was all about bringing the car home with as few scratches in the paintwork as possible. But I love all the wheel-to-wheel action with other drivers on the track – it’s a lot of fun. I’m already itching to get on with the next two races. How would you rate your own race debut as a member of the Mercedes AMG DTM team? Maximilian Götz: My first DTM race was really action-packed. The speed of my Mercedes-AMG C63 DTM was excellent, and I was able to overtake a couple of cars. Up to the safety car period, I managed to work my way forward to twelfth position. Unfortunately, I got spun round by another car after the restart and dropped to the rear of the field. Although I caught up again, I didn’t have time to regain any more places. Prior to the DTM season, it was said that tyre degradation could be an important factor during the race weekend. How did you manage? Maximilian Götz: I coped well with the tyre management. I possibly have a slight advantage in this area because of my experience in GT racing where we would be driving on a single set of tyres for up to two hours at a time. Consequently, I was able to allocate my tyres very efficiently and had no problems. Were you a bit nervous before your first race weekend in the DTM? Maximilian Götz: I may be a rookie, but frankly I was pretty relaxed before my DTM race debut. This may be down to the fact that I’ve experienced a lot over the past few years in motorsport. And I’m no longer 18 years young. But obviously there were a few butterflies just before the start of my first DTM race. That’s only to be expected. It was also long while since you’d been in a standing start. Sunday’s race was another action-packed affair. How would you sum up your first DTM wet race? Maximilian Götz: That was just as tempestuous! I got off to a good start, certainly better than in the first race. I gained two positions and worked my way up to P18. When the rain started, I switched to rain tyres relatively early, because I had a puncture. This meant that I was on wets one lap earlier than the rest of the field and I was able to overtake three cars. Ultimately, I finished 16th. Maximilian Götz: Absolutely. My lap times were respectable alongside the others, and I was the best rookie on the weekend. This race had the lot: rain, dry, overtaking, wheel-to-wheel action. And I’ve learnt a great deal. We now need to analyse the data we collected in order to get more out of the Lausitzring weekend.